Recently, I came across this Cauliflower Fried Rice Recipe at Fresh Family Meals, and was extremely skeptical about the end result. Traditional Chinese Fried Rice is one of the most popular and beloved Chinese food recipes out there, and some things are just sacred. That being said, I sure do LOVE fried rice, so despite my skepticism, the promise of delicious, low Points fried rice made me believe it was worth a shot. I tweaked the original version of the recipe just a tad to make it a bit tastier and a bit more Weight Watchers friendly, but let me tell you, it was fantastic! I can honestly say that it tasted pretty darn close to traditional fried rice. And it is surprisingly easy to prepare…the only real work involved is grating the cauliflower. I’d recommend a food processor for this task, but if you don’t have one, a cheese grater will work just fine, it’ll just require more elbow grease. This would make a perfect low Points Weight Watchers Side Dish to serve with your favorite main course…I served it with my Sesame Chicken, and it was perfection. Low calorie, low fat, low carb, low Points, and fabulous, familiar flavor…what more could you ask for? 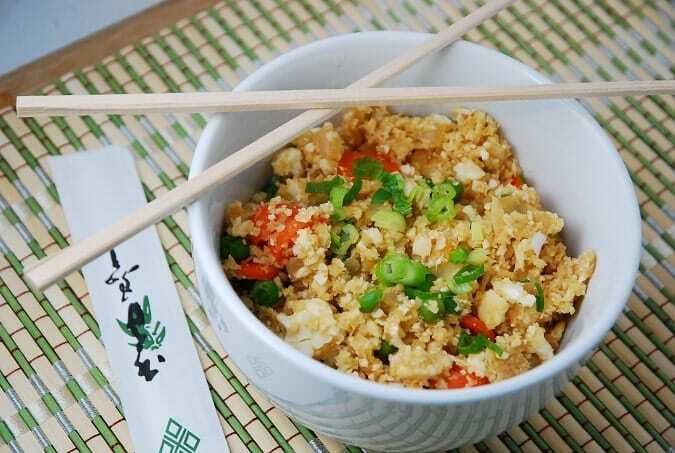 This Cauliflower Fried Rice Recipe is an absolute must try. What a way to satisfy your Chinese food craving! By subbing out the actual rice with grated cauliflower, you get a much healthier, yet equally tasty version of Chinese Fried Rice. This healthy side dish recipe is full of fiber and low in fat. Heat oil in a large skillet over medium high heat. Add in onions and garlic and sauté until onion soften, about 3 minutes. Add in peas and carrots, and cook until carrots become tender, about 4 minutes. Stir in cauliflower and soy sauce, and cook while stirring frequently for about 8 minutes. Add in the prepared egg whites, and cook until egg whites are heated through, about 2 minutes. I tried it as my first low carb dish for my client who has diabetes and my normal cooking is not low carb I followed your recipe which I don’t normally do but have never cooked cauli-rice yet alone heard of it. I got up this morning and started researching how to do this and it is pretty darn good. I did add some white fish that I previously baked everybody loves it except the one I cooked it for as it didn’t have a crap load of butter or sugar he will just have to get used to it. Thank You! I just finished making/eating this and it was SO GOOD!!! I made this cauliflower fried rice and was shocked how tasty it was! I suggest this to everyone!! I passed the recipe on to healthy co-workers who have made it over and over again. I’m so glad I found this!!!!! Could you use defrosted frozen cauliflower for this, or only fresh?